Earth to Self | Personal Altars for spiritual practice. 07 Jul Personal Altars for spiritual practice. The one thing that has solidified my spiritual practice in recent years is the regular creation of a personal altar. Some set up an altar that is more or less permanent. Me? I like to create and recreate my altar on a monthly basis, starting at the new moon. Currently I’m incorporating my personal altar practice with Ezzie Spencer’s Lunar Abundance process. My love of personal altars started during my training to become a Transpersonal Therapist. All of our learning took place in sacred circle with a temenos (circular altar) in the centre. This temenos acted as a visual anchor that created sacred space and a focal point for all members of the circle. Then I went through an 8-month program: Empower and Awaken Chakra Course for Women developed by my beautiful friend Sarah K Jones. 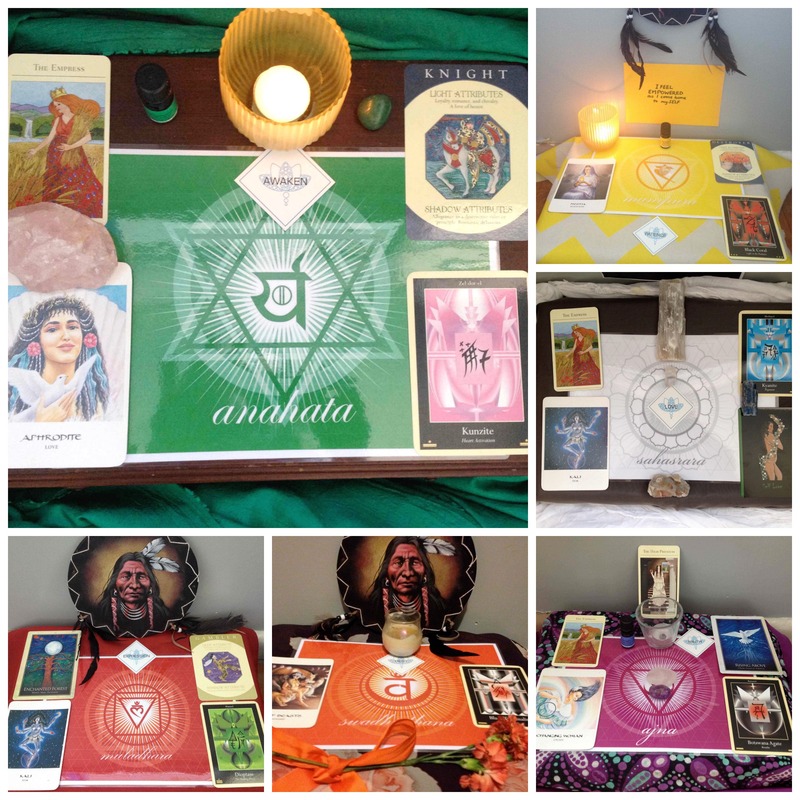 I naturally felt compelled to create a personal altar for each Chakra to hold and reflect my inner process as I worked my way through the exercises and initiations. Ever since then, my monthly altars have stuck. So, why a Personal Altar? + Inner Connection. Perhaps most importantly, a personal altar provides a focal point to help you connect with yourself. It is, afterall, an intimate reflection of you and your inner landscape. + A reminder. An altar can remind and encourage you to re-connect more often. You have something to look at, sit in front of, meditate on whilst undertaking your spiritual practice. +It’s tangible. Personal Altars are a visual, tactile and tangible representation of our inner process. By creating an altar, you are effectively giving shape to the workings of your soul. + Reflection. It’s a tool to reflect and reveal themes at work within your psyche. + Guidance. It’s a forum for inner and outer guidance to show up. 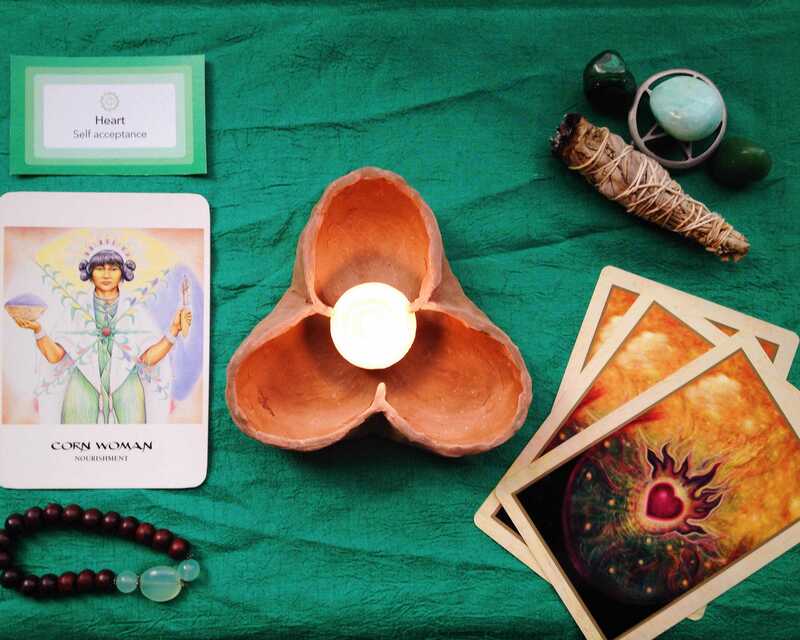 Often your personal altar, along with your question, theme or intention can take on a life of it’s own, showing up in your outer world via syncronicities, conversations and events. + Creative. The act of creating a personal altar is highly intuitive, creative and therapeutic. Like any type of expressive therapy, creating an altar comes from beyond the mind. + Expressive. The objects, colours and tools you feel compelled to include can enhance the meaning of your personal process – especially if you don’t intellectually understand why at the time. How you arrange these objects can provide further insight. I always create my personal altar within the first 3 days of the new moon. I find that this lends power and momentum to the process and it’s also a great way to connect to the lunar cycle. This is particularly important for women as the moon can connect us to our feminine rhythms. When using a personal altar to support your spiritual and emotional development, I recommend refreshing your altar every month. Things can change and move quickly and even if a certain learning is multilayered or taking a while to sink in (!) then it will keep showing up for you to continue working with it. For example, when I was working through the chakras the Goddess Demeter showed up 3 times. This was really poignant for me because at the time I was recovering from a late miscarriage and Demeter is the grieving Mother Goddess (amongst other things). Her presence helped me to work through my grief, to heal and to prepare myself for future pregnancies. It’s so important to record your learnings and progress as you move from month to month. I filled an entire visual diary when working through the charkas and looking back through it I can track my progress and understand at a greater level, the meaning of my visions, messages and drawings. + Journalling: particularly helpful to finetune your question, theme or intention for the month, as well as for reflecting on insights and learnings. + Drawing: If you happen to get visuals as you are working with your altar, either through meditations or spontaneous insights, it can be really helpful to draw what you see. A drawing can contain so much insight, often communicating what words can not express. + Following your dreams: If you have any significant dreams, it will deepen your process if your write them down and consider their meaning. Just the act of paying your dream some attention can uncover deeper insights. + Photographs of your altar: I always take a photo of my altars so that In have a visual record to refer back to. This is useful if you continue to get the same or similar messages overtime because you can then see how they relate or build upon one another. Want to know more about working with Personal Altars in your spiritual practice? It just so happens that I’m working on a ‘how to’ guide as we speak, complete with a guided meditation and other prompts to help you craft your altar each month. To be the first in the know, add your details to my mailing list above. 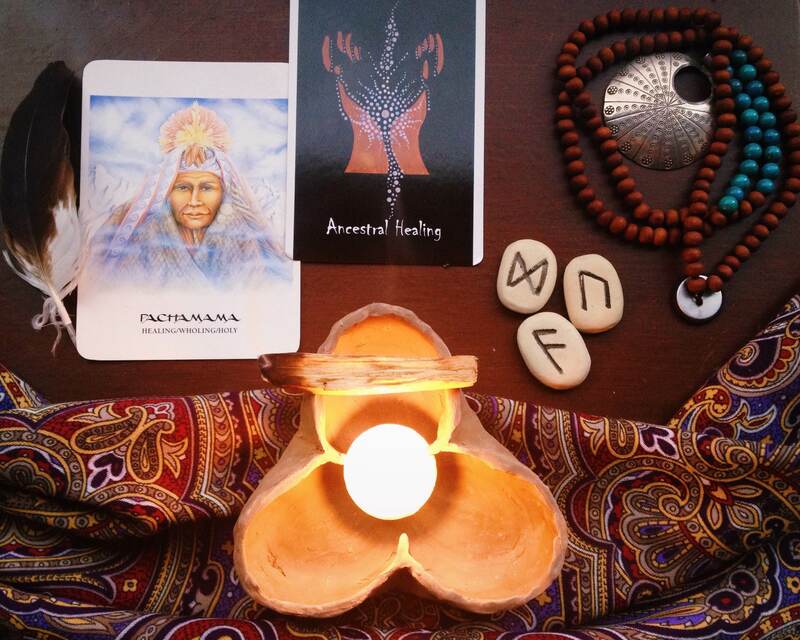 I’d love to know – do you currently work with a personal altar in your spiritual practice? Tell me what you love most about it in the comments below. Rachel, wow I have just learnt so much. I just stumbled across your blog and I’m so glad I did as I had never really known about any of this stuff before. I’m going to go through all your other posts now as I am totally interested in finding out more. Thanks for sharing! Hi Beth, That is so great to hear, thank you. Stay tuned because I’m in the process of developing a free offering around this very topic. Will lt you know when its ready. Thanks so much for getting in touch. This is such a beautiful post. I’ve always been intrigued by alters, they’re so sacred and divine. I’ve been meaning to create one for awhile now and after reading this post I really feel inspired to. That’s so good to hear Chloe. It’s such a beautiful practice once you get into it. Keep me posted! What a gorgeous post. Yes I love this and I must admit have always been fascinated by altars. I do create and refresh my own regular and also create healing spreads for clients in a similar way.